Ceylon spices are respected and highly valued in the whole world. In addition to taste, Ceylon spices are important key in maintaining a healthy lifestyle. Researches point out that arthritis, diabetes, heart diseases, and asthma can be treated using these spices, especially cinnamon. Therefore, incorporating these spices into your diet would be very beneficial. Sri Lanka is a green island located in the south of the Indian Ocean. The country was known as ‘Ceylon’ until 1972. Documented history of the country spans more than three thousand years but its actual history goes back more than hundred thousand of years. For many years, the country has been regarded as a home for popular spice products. Although spice farming dates back to 14th century, Ceylon spices have remained the most sought for food additives. According to statistics, 56% of Sri Lankan agricultural exports consist of spices, essential oils, and allied products. Due to the availability of rainfall, the presence of a warm, humid tropical climate, and rich soil, Ceylon species has unique taste, strong aroma, and natural health benefits. Ceylon cinnamon is known as ‘true cinnamon’ and ‘pure cinnamon’. It is obtained from the bark of Cinnamonum zealanicum, which is an evergreen plant native to Sri Lanka (Ceylon). The 90% of world production of true cinnamon originates from Sri Lanka. The unique method of processing and curing of cinnamon entices the characteristic flavor of cinnamon production of other countries, such as Cassia cinnamon. Countries in North and South America, together with other European countries, are the major importers of Ceylon cinnamon. Because of its aromatic nature, cinnamon is used mainly by Mexicans in making coffee. Similarly, it is used in flavoring other drinks and foods. Cinnamon powder, also known as ground cinnamon is the widely used form of cinnamon, which is made by grinding cinnamon sticks, chips, quillings, fetherings or chips. The quality of cinnamon powder is varies according the type and quality of the source. The customer should give a special attention to select a trusted source to buy cinnamon powder because there is no proper way to determine the quality of cinnamon powder unless a lab test. Sri Lanka exports Ceylon cinnamon as well as Ceylon cinnamon powder. It carries all benefits of cinnamon and easy to use with common food pallets and drinks. Cinnamon powder is widely uses in bakery products such as cinnamon rolls. It is a great combination with bee honey. You can add ground cinnamon to your coffee or tea or any other food preparation to obtain spice taste and attached natural health benefits . Regarded as King of Spice, pepper is a popular type of spice worldwide. Piper nigrum is the tree that produces black pepper. 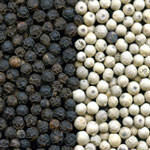 White pepper is produced by soaking and later drying ripe corns in the sun, while black pepper is a product of dried green berries. Although it may seem small, cloves is a very powerful type of Ceylon spice that is best used in both sweet and saline foods. Cloves are the products of the dried unopened flower buds of the Eugenia caryophyllus tree. Popularly known as the Queen of Spices, the use of cardamom has increased in the food industry. Cardamom is dried fruit of the small shrub named herbaceous perennial elettaria cardamomum. Confectioneries and baked products use cardamom as an ingredient because of its strong flavor. Nutmeg and mace are derived from the same plant known as Myristica frangrans. Nutmeg is the seed of the fruit, and mace is the dried net-like covering or aril of the seed. This spice is mostly used for production of essential oils, extracted oleoresins, nutmeg butter, and other related commercial products. Ginger is mostly used to add flavor to both sweet and salty dishes used internationally. It has been widely used in Ayurvedic medicine until today. Ginger adds a soft pungent, as well as a sweet aromatic taste when cooked or baked. It is at its best when added to a cup of hot tea. Due to topical climate, rich soil, and natural production, the spice crops grown in Sri Lanka are richer in terms of ingredients as compared to spice products elsewhere in the world. Most of countries across the globe use more of Sri Lankan spicy products in their industries to make high quality products. These spices have medicinal values, and thus why they are largely used in pharmaceutical industries. The natural form of Ceylon spices are of great benefit to the food and cosmetic industries. At www.trueceylonspices.com, we are proudly behind of the natural quality of our products. Living with cultivation of products listed in our website, we are directly delivering products worldwide from its real origin. It means that when you purchase your Ceylon spices at www.trueceylonspices.com, you will not only be getting the flavor but acquiring all the benefits that come with each ingredient. This is a native Sri Lankan(Ceylon) Website. Your items will ship directly from Sri Lanka. Products are 100% natural & Weedicide free.